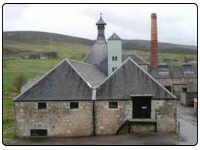 The Brora Distillery is very famous and one with excellent malt whiskies. In the 1970's the distillery was called originally known as Clynelish and was a very success. Like every distillery in Scotland it was hit was a hard time in the late 70's and early 80's when times were hard and never reallyy gain any more success and closed its doors sadly in 1983. It could be reopened if the owners really wanted to, but this is unlikely as it has been closed for over 25 years and with the times we are now in this would be an expense that the owners would unlikely do. You will see below a full range of malts aged 30 years running from 2003 to 2007. All these malts are excellent, but do have a high price tag with one of the reasons that the distillery is unlikely to have a 30 year again. If you would like to find out old contact details for Brora Distillery please go to Berry Bros & Rudd. You can see the Brora Single Malt Whisky Range on this website.